Bolted tanks, either standard bolted steel or corrugated, are the most cost effective solution for your storage requirements. With a range of shipping options and ease of erection of modular construction we can supply the required tank size to your location in the most cost effective package. 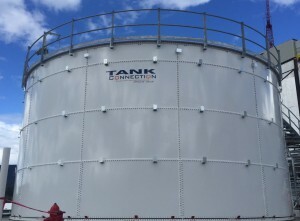 Western Tank and Lining Ltd. has been installing steel bolted tanks and reservoirs for over 25 years in Western Canada and various other locations around the world. Our crews have benefited from this experience and have developed into cohesive team with skill on various tanks in a wide range of locations. As well as the years of combined experience, WTL crews are factory trained erectors, certified in all safety requirements for tank erection projects. Please contact one of our offices for a complete project history.